Apply 1-2 pumps from knees to toes daily. Reapply as required. The Mama Mio Lucky Legs Cooling Leg Gel has been helping me get through my third trimester. My feet have been swollen, especially when waking up in the morning. One squirt of this Cooling Leg Gel is enough for both feet. I love how I can use it up to both of my knees using one more squirt. My hands have been swollen, too so it helps while applying it on my feet and legs. The peppermint / spearmint scent sure does wake me up in the morning as well! Swollen feet are no fun, but this product is helping! 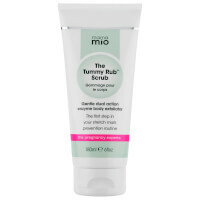 Thanks, Mama Mio for such a wonderful product. I like a cooling leg gel very much! It’s very refreshing and smells tasty, would buy it again! Such a needed treat while pregnant! I love this lotion and look forward to using it every night. It helps with my swollen and restless legs and also just feels wonderful! Although I am not pregnant my ankles swell up almost daily. Someone recommended I buy this cream and I have found relief to the swelling. It doesn't reduce all my swelling but my legs, ankles and feet feel so much better. Thank you Mama Mio! I have had restless legs throughout my entire pregnancy. Nothing helped (yoga, excercise, stretching, drinking more water, cold shower, warm bath, Epsom salts, etc). THIS WORKED! I am finally able to fall asleep after months of discomfort. I won’t go another night without it. I get very hot at night, and a dab of this on my chest and lower back also helps keep me cool. I was skeptical, but I am a convert. Will definitely buy this for all my friends. I absolutely love this stuff! I keep it by my bed and put it on every night. Can't fall asleep without it. It's definitely helped relax my legs and feet. I started with the little bottle in the variety starter pack. I got nervous when I realized I was running out and couldn't go through the rest of my pregnancy without it. 17 October 2017 by Love! This product is just as gentle as the name. The smell is very light, but the peppermint is very refreshing. A nice feel good feeling anytime you apply. I absolutely love this product. I am not pregnant but I just finished receiving chemotherapy and my legs would hurt from the chemo. I use this and I promise it helps with the soreness. I bought my mom some to use on her legs. She has has total knee replacement on both legs and she uses it when her legs get sore. We love it!!! Great Even For People Not Pregnant! While I've never been pregnant, I've used this product to relieve aches and pains from long days of working outside. The cooling sensation is great and the scent is wonderful for peace of mind. Will continue to buy. My mom suffers with restless legs and I suffer from aching legs and feet. Both of us are well beyond our pregnancy years, but the menthol and herbs in Lucky Legs is the most relieving cream we've ever used. Works immediately, especially if your calves or bottom of feel, between toes are aching. Don't stop making this little gem. I'm not even in website's age group...goes to 54...I'm 63 and my Mom is 83. Don't have to be young and expecting to use these outstanding products. The Buff products works great for exfoliation esp if you have really dry skin. Better put in on in the tub, rub in and shower off. Wonderful! I love this product .......I apply when I feel my legs have given up and within second it just give me energy!! !........Highly recommend it as later in the pregnancy legs hurt really bad this will definitely come to the rescue!!! Early in my second pregnancy I had terrible lower leg pain/fatigue. Lucky Legs was the only thing that helped. I love this product! When you legs/feet are exhausted and they still ache when sitting, lucky legs sooths and refreshes them. It smells great too! It has very good ingredients and works very well during my pregnancy. I didn't have any puffy leg.